Sixty year old Matal Hansda, or Jagot Matal, as he likes to call himself, is a born musician, and the quintessential free spirit, an attribute common to many in his clan. He never went to school and struggled with poverty in his youth, eking out a meagre subsistence as a cowherd in his village. 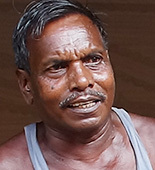 He later managed to join a colliery in Jharkhand, where he worked as a "dolly man". Earning a decent income, he was able to marry and look after his family. He however kept in touch with his music, taking part in local village performances whenever opportunity presented itself. Now retired, Matal is back to what he values most - his freedom and his music and he is back at his previous occupation as a "bagal", taking the village cows to graze, morning and evening. Matal has been playing the huka banam since he was 18, having learnt it from his father. He rues the fact that most youngsters have no desire to learn such instruments any more. His son too has shown no interest. Immersed in music, Matal spends most of his time, whether grazing cows in nearby fields or by himself at home, singing the traditional songs he learnt in his childhood, accompanying himself on his huka banam. He has in the past made his own banams, both huka and dhodhro and also plays the tirio (flute) and the paata bnashi - a leaf flute.